The box cover art for the first ever edition of Warhammer. Back in 1983, fledgling games company Games Workshop got together with miniature manufacturers Citadel Miniatures and published a little game they called Warhammer (note the absence of Fantasy Battle as included in the title of future editions). This simple boxed game, consisting of three flimsy rule books and a bunch of six-sided dice, was designed as a crossover wargaming/role-playing game, with which players could resolve massive battles or small one-on-one encounters between individual characters. 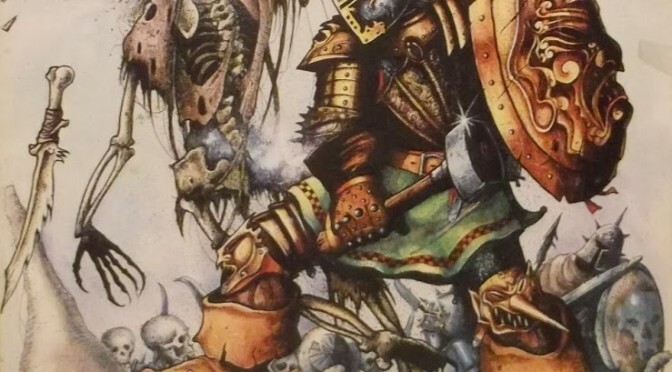 Here’s what you got when you purchased the first ever edition of Warhammer. Volume 1: Tabletop Battles. This was, as the title suggests, a series of rules for fighting out battles between massed ranks of figures on the tabletop. The rules themselves were quite simple, with most of the action being resolved by rolling multiple six-sided dice. Unlike later editions, the psychology rules relied on a straightforward roll of a dice, and didn’t take into account the personal attributes of the affected units, but for all that they were still quite effective. Volume 2: Magic. This book included everything you needed to use magic and spell casters in your games. Unlike with later editions, magic in the first edition of Warhammer relied quite heavily on the use of talismans and other focus objects, with spells being selected at the start of each battle. The magic rules also included a fumble system, which I vaguely remember made using spell casters a lot of fun in-game. Volume 3: Characters. These were the role-playing rules of Warhammer, and to be perfectly honest they were very simplistic, even for the early eighties. 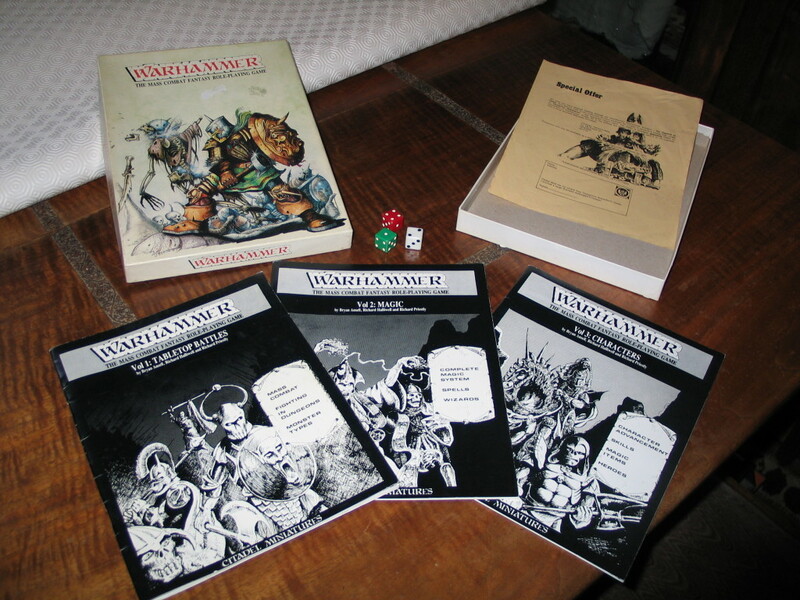 At the time of Warhammer’s release the role-playing industry was effectively dominated by two games: Dungeons & Dragons (at that point almost a decade old and entering its third edition alongside Advanced Dungeons & Dragons) and Runequest (already into its second edition and the first game to introduce its own unified game-world). To say that Warhammer was aiming high if it wanted to make a name for itself as a role-playing game would be a bit of an understatement. Even so, I remember my friends and I giving the rules a good shakedown and not being overly disappointed. When Warhammer first came out it was well received, with a lot of players praising its simplicity and ease-of-use. Even though the first edition was poorly presented and poorly presented it quickly became a popular system for tabletop battles, and this paved the way for a quickly produced expansion pack, Forces Of Fantasy. This second product was more deliberately aimed at wargamers, and included organised army lists and the concept of assigning points values to individual figures and units, allowing players to field armies of approximate equal strength. It also introduced more wargame-orientated rules, such as the use of standard bearers, musicians and unit champions. The Book of Battalions, an army list supplement for Warhammer 1st edition. 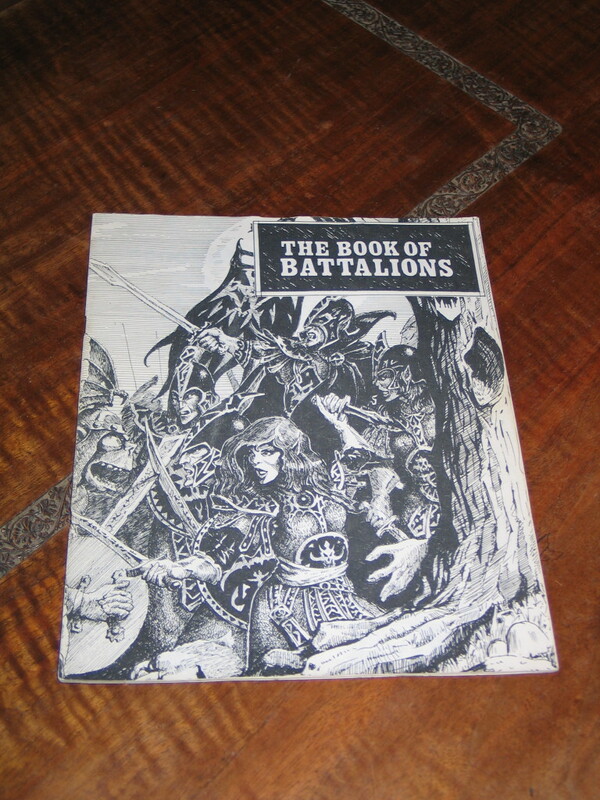 Also included with the Forces of Fantasy boxed set was a book outlining example armies, known as The Book of Battalions. For some reason I seem to have acquired two copies of this book, though I’ve never owned a copy of the aforementioned Forces of Fantasy. Reading through the example armies listed in The Book of Battalions it’s easy to see the British influence, with most of the army leaders and champions having comedic names. This thread of comedy would continue throughout the Warhammer product range for the next decade, and is one of the things that made the game so much fun for a young and impressionable me. Getting back to the core boxed set, the rules included two sample scenarios – one, called The Redwake River Valley, a role-playing campaign included in the Characters book. The other sample scenario, The Ziggurat of Doom was a classic tabletop battle, with a small group of beleaguered dwarves trapped on the titular ziggurat while hordes of screaming goblins advanced upon them. Okay, so the dwarves numbered seven in total (including their leader) and the hordes of goblins amounted to a maximum of thirty-six of the little greenskins spread over four game turns, but at least it was a start and given the low number of figures required would have been well within the reach of most of those early wargamers. Looking back, even though Warhammer first edition wasn’t my first introduction to wargaming (that honour fell to the second edition, properly titled Warhammer Fantasy Battle) I still have a bit of a soft spot for this game. At some point I may well gather together a couple of friends and play out both the tabletop battle Ziggurat of Doom scenario and the role-playing campaign of The Redwake River Valley, complete with appropriate figures if I can find them. And that, my friends, is how it all started. 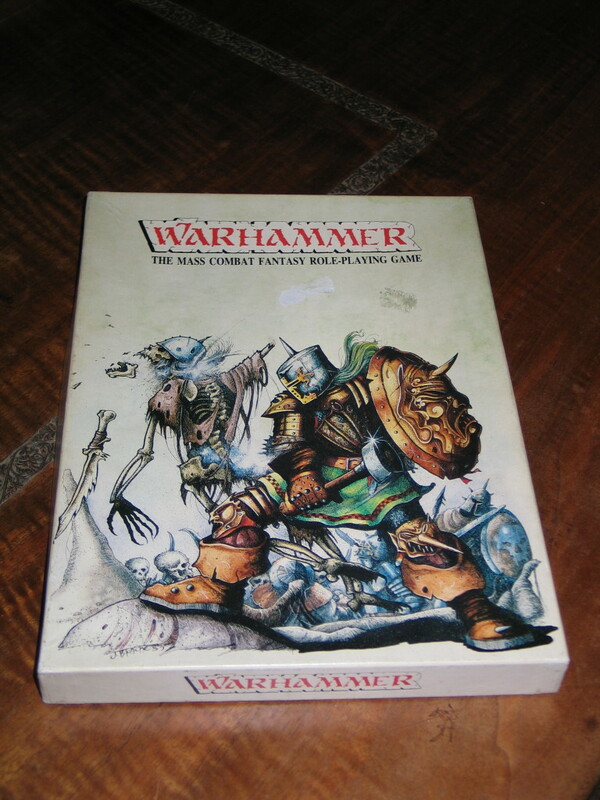 A short year after Warhammer was released Games Workshop were ready to cash in on their next big product, which as it happened was nothing more than an updated and repackaged version of the same game, released under the title of Warhammer Fantasy Battle. I’ll be back to talk about that second edition of the game some other time.